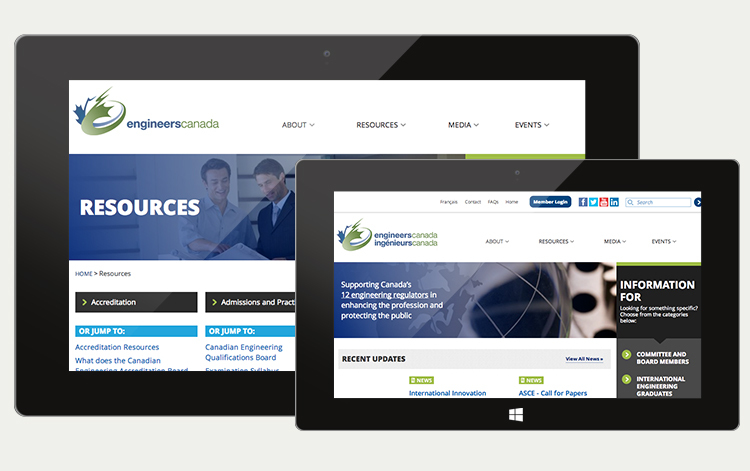 Engineers Canada, a national organization that supports Canada’s twelve engineering regulators in enhancing the profession, engaged Industrial to redesign their website in late 2012. Engineers Canada was looking to meet the challenge of representing organizations from across the country to provide a national identity for the engineering profession in Canada. 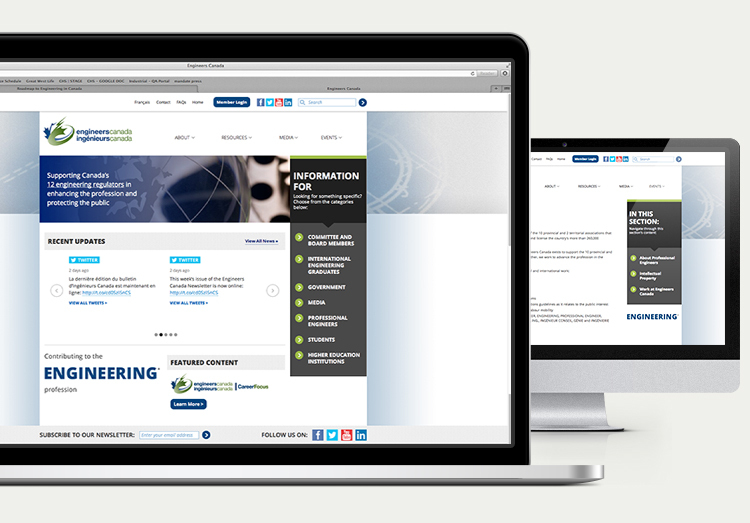 Engineers Canada was looking for a way to improve its users’ experience on the website, allowing them to more easily find content. Industrial began creating an information architecture (IA) by leading several content mapping exercises. Industrial’s approach to user focused design centered on providing the user with fewer menu choices in order to offer a clearer picture as to where the content they are looking for resides on the site. During the planning phase, Industrial also created a taxonomy of all of Engineers Canada’s core audiences. This would allow users to self-select content based on their needs. To further emphasize the navigation of content, Industrial created a simple design that accented way-finding points for the user. The design was also tailored to accommodate Engineers Canada’s current branding and support its legal requirements. Using the taxonomy created prior to development, Industrial developed a system that allowed users to find content based on their audience type (for example, “I am a member of the media” returns only the content tagged as being relevant to media). In order to support the ongoing maintenance of the Engineers Canada website, Industrial ensured that the Content Management System (CMS) used was configured to be flexible and easily expandable. As a result, ongoing content creation is easily maintained through the use of re-usable widgets. Industrial has also delivered ongoing maintenance and support, ensuring that the website stays secure and up-to-date. 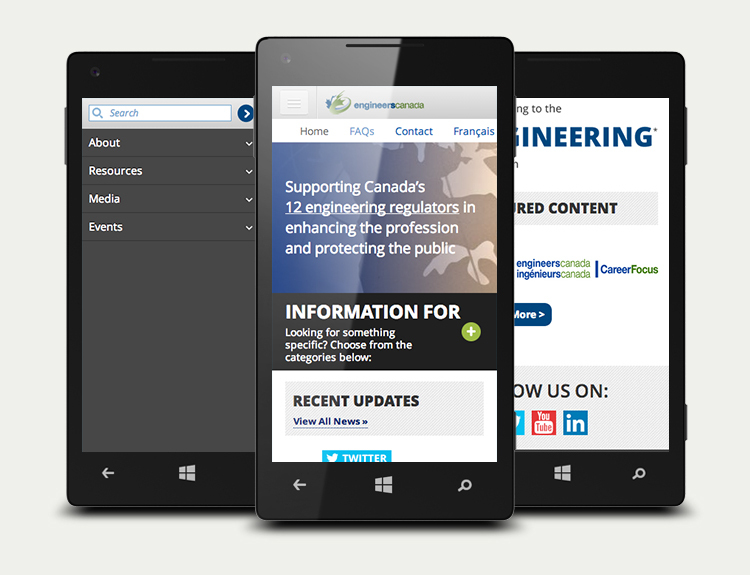 Industrial implemented the Engineers Canada website using a mobile-first development approach. This process was vital in ensuring that the website would scale up across all devices and support all browsers. A major consideration in this approach was the loading time of the website: it would be a measure by which Engineers Canada would consider the project a success. In addition to the mobile-first development approach, Industrial also optimized the sites imagery, carrying through a design that relied on small visual cues rather than an image-heavy design, lightening the resource load and resulting in faster page load speeds. The launch of the Engineers Canada website was timed to coincide with internal announcements to its staff. By all accounts it has been a success, and Engineers Canada continues to receive positive feedback from its staff and across its social media channels. Engineers Canada is the national organization of the provincial and territorial associations that regulate the practice of engineering in Canada.